I've never been able to make up my mind about tahini. I love things like hummus and baba ganoush, but I've found it unpalatable in other dishes. But in this recipe? It's actually the star! Although this appetizer should seem a lot easier to make in theory, it's a little tricky and not for the heavy-handed. Cooking and mixing everything is simple enough, but it's the building of the rolls that can go either way. Tahini and lemon juice are mixed into cooked quinoa, creating a sticky, stiff mixture that you roll into little logs. 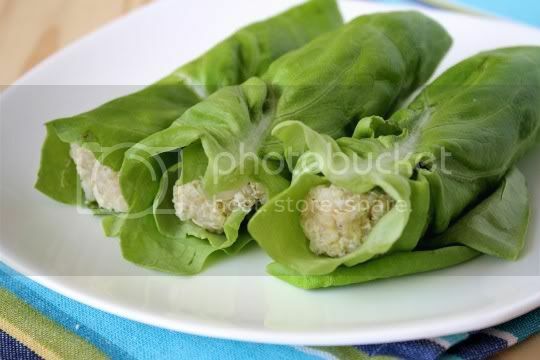 These quinoa logs--along with a few fresh mint leaves--are then rolled into lettuce leaves, and that's that. Seems easy enough, right? Well it is, but you must be careful with the rolling, as the lettuce can easily tear. The quinoa logs can also start crumbling apart if you don't pack them hard enough. I'd suggest securing these with toothpicks too. As far as eating them goes, I think the mint would be much better incorporated in this recipe if it's chopped and mixed in with the quinoa, instead of placed inside the rolls. But on to the important thing: flavor. These rolls are so good! The tahini is bitter, smoky, roasted, and savory, and the chewy nutty quinoa is a great complement. If you don't have quinoa, brown rice would probably be a great substitute here. 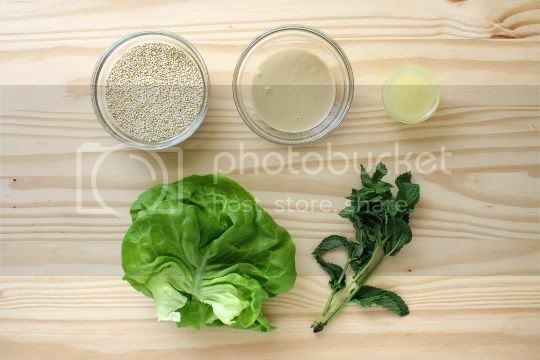 The lemon juice adds a bit of tanginess, but it seems to emphasize the tahini flavors. 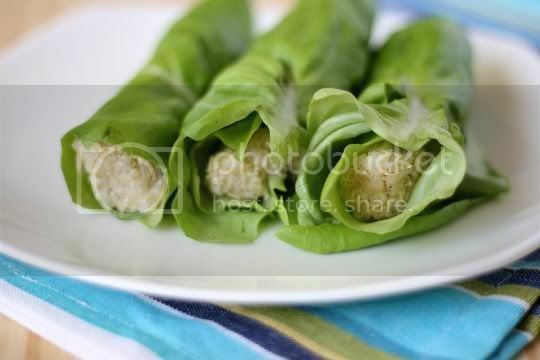 The mint gives the rolls a nice Mediterranean flair, and the lettuce is crunchy and refreshing (I think these are best served cold). About two of these rolls is enough for an appetizer, while three or four is enough for a full meal. They'd pair quite nicely with a light soup or stew, or maybe a side of grilled faux meat. Make again? Yes. Quinoa and tahini, what a treat! These are great sites you've made! So cool & pretty! Wish I lived in LA so I could check out more of these places. But life up here in the Bay area ain't bad for a veggie either.